Cooler weather means that I’m in the mood for hot drinks that will take the chill off when I come in out of the cold. 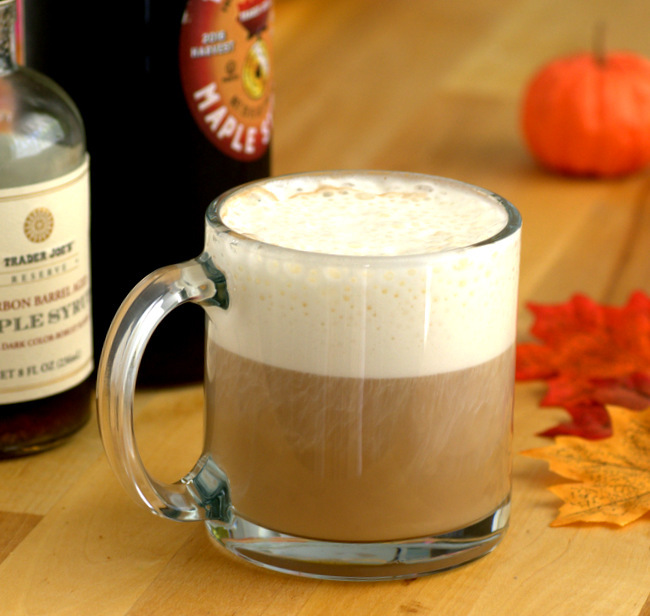 This Maple Earl Grey Tea Latte is a simple drink that is perfect for warming up on a fall day, with a great combination of flavors and an easy technique that doesn’t require a trip to the local coffee shop. A tea latte is hot, brewed tea topped with steamed milk. For this drink, I used earl grey tea and topped it with steamed milk that is lightly flavored with maple syrup and vanilla. I brew my tea with two teabags – or a slightly larger scoop of loose leaf tea than usual – so I get plenty of the citrusy earl grey tea flavor in the drink. The hot tea is sweetened with pure maple syrup and I used a fairly generous pour because I wanted to ensure that I could taste the maple in every sip. Feel free to adjust it to taste. I added a small amount of maple syrup and a few drops of vanilla extract to the milk before steaming it. It’s just enough to tie the milk in with the tea perfectly and give the drink a few extra layers of flavor, elevating it to “coffee shop quality” even though you’re making it at home. Though steamed milk is generally used to finish the latte, you don’t need to have a milk steaming espresso machine at home to make it. The easiest way to make “steamed” milk at home is by heating up some milk in the microwave and vigorously whisking it with a small whisk until it is frothy. This won’t yield the thick foam that you will get by steaming milk, but it will be frothy enough to leave a nice layer of foam on top of your drink! If you make steamed milk on a regular basis, check out the milk frother that I use, which works perfectly for drinks like this one. Feel free to up the quantities here if you’re going to serve a crowd. This recipe makes one serving, perfect for treating yourself! In a large mug, combine hot earl grey tea and maple syrup, stirring to dissolve the syrup. In a small bowl or glass, combine milk with 1 tsp maple syrup and vanilla extract. Heat milk using a milk frother, or microwave milk to warm it up and whisk vigorously until frothy. Top hot tea with foamy milk.